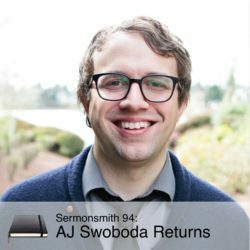 Dr. A. J. Swoboda is a professor, author, and pastor of Theophilus in urban Portland, Oregon. He is the lead mentor of a Doctor of Ministry program on the Holy Spirit and Leadership at Fuller Seminary, and teaches theology, biblical studies, and Christian history at a number of other universities and Bible colleges. He is the director of Blessed Earth Northwest, an organization focused on creation care issues and Sabbath in the Pacific Northwest. A.J. also serves as the executive director of the Seminary Stewardship Alliance—a consortium of Christian higher-ed schools that provide Christian training in creation care and are implementing sustainable practices. Previous to this, A.J. served as a campus pastor at the University of Oregon. His doctoral research at the University of Birmingham (U.K.) explored the never-ending relationship between the Holy Spirit and ecology. A.J. is also the curator of greenjesus.com, a site on creation care. He is a member of the American Academy of Religion and the Society for Pentecostal Studies. A.J. is the author of Subversive Sabbath (Brazos Press), The Dusty Ones (Baker), and Introducing Evangelical Ecotheology (Baker Academic).